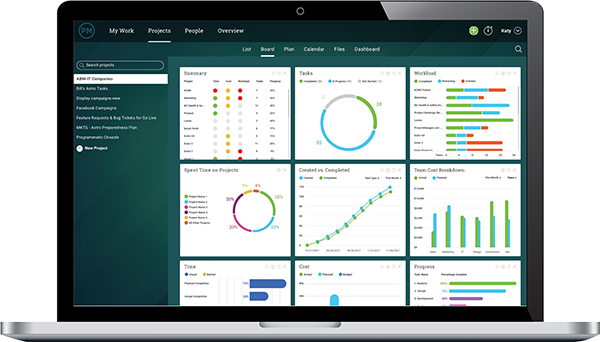 ProjectManager.com works best as a project collaboration software, where the entire team has access to our suite of project management tools. Add team members, assign them tasks and give them more visibility into their progress and their role. Watch this handy video for visual instructions on how to add more users to ProjectManager.com. There are three primary places you can click to add new users to your project. Once you have filled out the user’s information and assigned them a role, they will receive an email invitation to the software, asking them to update their login information. Once they log in, they have been officially added to the project and can be assigned tasks immediately! Managers and admins will have access to, and appreciate, the breadth of features that ProjectManager.com has to offer. However, team members really only need to access and focus on these three areas in the software. Team members will spend the majority of their time on the Tasks page. Here they can see all of their tasks, their corresponding projects, their due dates and their percentage complete. Team members can even prioritize and filter their tasks to make sure they are hitting all the important deadlines. Task attachments, notes and comments can also be accessed from this page, so it’s really a central hub for getting everything they need to accomplish their work. As they work on their tasks, their time is automatically updated everywhere throughout the system, including the Gantt page, workload calendar and timesheets. The Activity page is a live stream of all the activities happening on the project. Your team members will receive real-time updates whenever changes happen, such as a new task comment, a new file upload, or a new task assignment. Users can also initiate chats here or send direct messages, fostering a collaborative environment. This can be essential when team members have to work together to knock out project tasks. When working together, it’s easy to upload important documents or share links right in the Activity view. We offer secure and easy-to-use online timesheets. Our timesheets can be manually populated by the team member, or it can be automatically updated as they input how many hours they’ve worked on each task in the task view. Once they update their timesheet and submit it for approval, it can no longer be adjusted, and managers can then approve those hours with just one click. Your team is the lifeblood of the project. Gone are the days when you had to do all the heavy lifting with the project tools. The sooner you get your team onboarded into a collaborative project management software like ProjectManager.com, the sooner your productivity will skyrocket. See just how quickly you can get started on the path to success with this free 30-day trial.